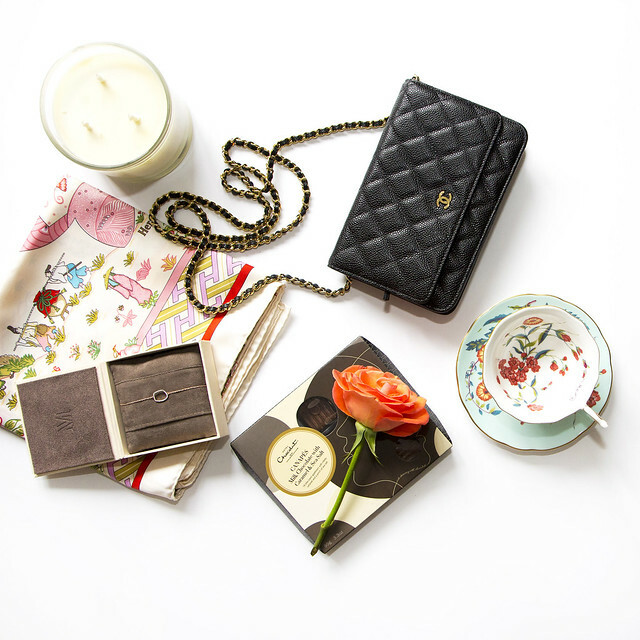 Clockwise: Chanel WOC (similar, get 10% off with code APRILFLASH), Wedgwood teacup set, a rose, Hotel Chocolat caramel & sea salt chocolates, Monica Vinader Riva diamond bracelet, Hermes scarf, Geodesis candle. Thank you, ladies for all your tips and suggestions. Keep them coming! I'll be hitting the make up counters over the next few days armed with a list of your recommendations. Needless to say, I'm rather clueless about beauty products so all your comments have been particularly helpful. Merci! It took me over a year to find a caviar Chanel WOC but this durable leather makes it worry free when I'm out and about, in rain or sunshine. (BTW, I once purchased an old and sad looking Chanel caviar bag and restored it to near new condition. That's how fabulous the leather is). I'm rather obsessed with Wedgwood teacup and saucer sets these days. This one's made in England and is dainty and pretty, the anti-thesis of my tomboy self. Suffice to say, I'm hooked on anything that has the label "salted butter caramel" including these chocolates from Hotel Chocolat. A close friend of mine brought over a large bouquet of roses. They're in full bloom more than a week later. A huge thank you to Monica Vinader for gifting me with something on my wish list. I've been collecting Hermes scarves for a while, particularly ones with an Oriental theme. I hope to frame this "Ballade de Heian" someday. By the way, this is Natsuno Hidaka, the artist's illustration of the life in the Heian dynasty in Japan from 794 to 1185 A.D.
8. Jane Iredale lipstick in "Ashley"
I totally agree regarding the caviar WOC! 2- Hermes Mythiques Phoenix cotton gauze shawl in Blue Nuit. 3- An old David Yurman Wheat necklace worn by itself (sans pendant) - love it with boho tops. 10 -Rencontre Ocean H enamel bracelet in dark blue background with fish in reds and blues - worn with white. A favorite in summer. umm can i just say i'm all sorts of obsessed w/ this post? chanel, hermes and diamonds what's not to love!! plus food.. you know how much i love food. wahaha and i love anything salted caramel too.. the perfect balance of savory and sweet! as of late i've become COMPLETELY and utterly obssessed w/ chinaware namely in respect to tea/tea pots/tea sets ect. i love your wedgewood tea cup set!